February 25th, Louang Prabang, Lao P.D.R. By the time we had stocked up on a large supply of provisions (cookies, bread, cookies, porridge, and more cookies), and attended to the remains of our to-do list, it was almost 11am before we started making our way out of Vientianne. - Trucks, cars, scooters, and tuk-tuks all zipped by us on the shaky and poorly repaired roads. People stared at us from the back of pick-up trucks and buses and shop windows. But it wasn't long before the shops and the vehicles quickly started petering out. Indeed after 30km's we found ourselves once again out riding through villages with waving children, and having to be careful to plan our stops for water. The sun beat down apon us, and with the brightness and heat combined to make an afternoon of monotonous and not terribly enjoyable cycling. We stopped in the town of Ban Keun for a late lunch of pretty bad 'feu' and a sugar top-up of Pepsi. Ban Keun sits right by a beutiful river with great big shady trees and it would have been an excellent place to have an after lunch snooze and wait for the heat of the day to die down. But this is Asia, and Ban Keun has a great population of kids and adolescents for whom, we are the most interesting thing since television. Our shady rest spot was quickly invaded by kids looking at our bikes and trying on our cycling gloves, and then the usual first question by a shaky English student, "where are you from?" In this case the English student was a girl called "Miss" Tuey, and as we quickly realised that we weren't going to get our afternoon nap, we decided to come with her to her mothers cafe for a glass of water and an hour of difficult conversation. Actually, it was quite an enjoyable chat, and we've found English students to be one of the only ways that we can learn some Lao phrases. Our new found friend was particularly happy to find that we were both not married, and insisted that we take her phone number before leaving. 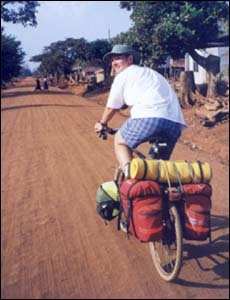 We cycled on in search of Ang Nam Ngum, a resevoir 20-30km's up the road, and a place to camp. On the way we stopped to ask some people in a cafe if a road led to the resevoir. They turned out to be Chinese electrical workers, and I hopped off my bike to try practicing my 3 lessons of Chinese with them. Unfortunatly, the practice session turned out to be abysmal because my Mandarin is worse than my Lao, and they had an interpreter who spoke great English. - All to quickly we found ourselves talking only to the interpreter while the rest talked amongst themselves. When it came up that I lived in HK, one of the Chinese guys became eager to buy some HK money off me for his collection. However, my lowest denomination HK bill was worth the equivalent of a mountain of Lao money and he was a little disappointed. - In the end we settled on a couple beers which everyone got to share before they headed off back to Vientianne, and us to find somewhere to sleep. The sun had set by the time we struggled to the top of a steep dirt road giving us a gorgeous view of the resevoir several hundred feet below. We descended to find that the road led only to a logging port on the lake, with piles of dead trees interspersed by the occasional dead truck with the engine covers off and parts lying around. - While it didn't score too high on being picturesqe, being beside the lake gave us plenty of water, and being with all the dead trees around, there was no shortage of firewood. - That night we cooked ourselves an amazing ham & pasta dish with cream. It was delicious, and Richard proclaimed it was one of the best he'd had. I went to sleep under the stars by the glowing embers of the fire, while Richard enjoyed the whole tent to himself. The next day after a warm bowl of porridge, we charted a small boat to take us accross the lake instead of cycling the 60kms around it. The boat was quite small, about 5m long, 1/2 a meter wide, and about 10cms above the water line. We carefully kept our balance and resisted moving as the 2-stroke engine sped us accross the water. The resevoir had been created when by a dam in the not too distant past, and we sped by tree trunks jutting out of the water, and occasionally glanced at tree trunks just hidden below the water line. I remarked to Rich that the guy must really know the lake well to be avoiding the submerged trunks. It soon turned out that he didn't when the boat lurched upwards, sprayed us with water, and then rocked dangerously from side to side. But we stayed upright and the boatman grinned nervously at us. We grinned nervously back and held on tight for the next couple hours till we made it to dry land. From the shore our destination of Vang Vieng was a short and enjoyable 30km cycle through rolling hills with a nice cool breeze. - Passing through one village with Rich a couple hundred meters ahead, I noticed to my left what appeared to be a swarm of locusts flying up from a tree. As I looked more closely, the locusts became leaves, and a funnel of dust became apparent. I was watching a baby-tornado and as it crossed some distance behind me I was buffetted by its winds. - The funnel crossed over onto a dusty lot and picked up a plume of dirt which span ways up. I stopped to ohhhh and ahhhh with the locals while a bunch of kids playing football ran for their lives. - It wobbled back and forth for a while and eventually petered out... well cool. I cycled on 1/2 km to find Richard waiting for me. He'd missed it all. It is funny that while back at home, we often think of these far away places in Asia as being remote, difficult and hard to travel around. Exotic pictures of crowded markets, ethnic minorities, and weird transportation build up a sense of awe at the prospect of travelling to these far away places. But more and more people are building up the courage to come out here, and are setting off with the same guidebooks recommending the same towns, hotels, and restaurants. The result is the formation of a strange 'backpacker trail' with ample supplies of budget guesthouses, western restaurants, and English speaking bus conductors. 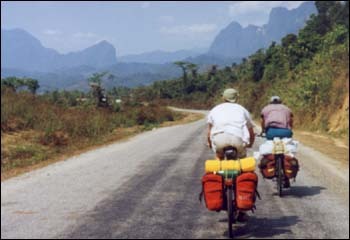 With only one decent N-S road, and very little choice in destinations, this 'backpacker trail' is so apparent here in Lao, and especially in Vang Vieng. 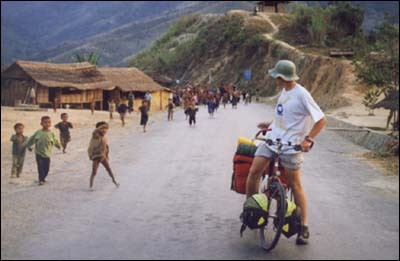 - 20kms down the road, villagers don't even know 'hello' from 'bye bye' and will crowd round Richard in awe as he repairs a puncture, but in Vang Vieng no one gives us a second look unless they are selling opium or wanting to change money. For us it is comforting to come accross the backpacker trail. It gives us the opportunity to stock up on good food, and enjoy western toilets, but many people never seem to leave the trail. We talk to people who speak to us just like from a guidebook. They can tell us of bus schedules, and where the cheap guesthouses and describe fun things to do at all the major stops along the way, but they never seem to be speaking in awe of the country and people around them. I feel maybe a little sorry for many of these 'backpackers' as they peer at us from the windows of passing buses, and talk about us in restaurants as we cycle by. The bikes have given us an unexpected freedom and pushed us off a trail that we would almost certainly be travelling on otherwise. Still, it is a great thing that there are so many people coming out here to experience a different life. - Everyone experiences something new out here, even if they follow the guidebooks and the 'trail' down to the letter. And there are people from all walks of life here, who have dropped what they are doing for a couple weeks or a couple years to check out what is going on in this part of the world.... pre-college students, busy stockbrokers and engineers, retired couples, teenagers travelling with their parents and mothers travelling with their children! For anyone thinking of taking off and coming out here, they should be safer than ever in the knowledge that it is easier than ever, and there are friendly and happy people all along the way to help out and point you in the right direction. Vang Vieng turned out to be a wonderful little town set amongst more stunning limestone pinnacles. When backpackers first started coming to Lao and the road north hadn't yet been paved, this town became popular as a halfway stop on the way North to Louang Prabang. With a new edition of the Lonely Planet being published in November 98, this town has become a sensation almost overnight. - It seemed that all the foreigners who had been in Vientianne had all made it up on the same bus to this town, but now the hundreds of backpackers contrasted loudly against only a small local population. Delaying a day turned out to be a blessing in disguise. Richard, while out and abouts, bumped into the 25,000km Italian super-cyclists again and we met up for dinner and had a great little chat. In comparison to our little cycle from Bangkok, Luciano and Verena dazzled us with stories of battling winds in the deserts in NW China and living amongst the crowds of India. All in all a fascinating 40 something couple who quit their lives where they were living in Switzerland to pedal around the world. Like us, they were hardly bicycle fanatics and were totally new to cycling when they left Switzerland 2 years ago. Luciano & Verena are heading to Hong Kong too, so you'll probably be seeing a bit more of them in the journal to come. Indeed the next day, 20kms from Vang Vieng we bumped into them washing their teeth in a little stream by the road. We cycled on together at a leisurly pace exchanging stories, comparing plans, and sharing ideas. We stopped in Kasi for lunch, and afterwards watched as Verena filled up some plastic boxes with restaurant food for the evening. Richard and I looked at each other and both thought "why didn't we think of that?" Despite the peaceful nature of the Lao people, there is still a large amount of armed dissent in parts of the country. In particular many of the Hmong people who sided with the CIA in the 60's are still now being squeezed by the Pathet Lao government. For the last several years the road between Kasi & Louang Prabang has been frought with rebel attacks and banditry. In Vientianne we checked in with the US Embassy to see what the story was, and when we informed the guy of our plans he politely informed us that we would be crazy to attempt it. The Oz embassy was a little more helpful in terms of statistics (no incidents for the last 8 months) but also advised against cycling the route. So we were a little cautious when we approached Kasi and kept our eyes peeled for evil people with guns. But instead all we found were children jumping up and down, waving and running after our bikes shouting "hellos" and "sabaii-dii's." One cyclist we met described it as the 'Tour de France' treatment! - The village before Kasi was the friendliest yet so we decided to trust our instincts and carry on regardless. From Kasi, Route 13 heads up hill through spectacular scenery and towering mountains. Every village we passed through gave us a better and better 'tour de France' welcome, and before long our faces were hurting for all the grinning. Amusingly the 'hellos' got mixed up with 'thank-yous' in some villages and 'bye-byes' in other villages. So Richard and I gaily cycled through villages shouting hellos, thank-you's and bye-bye's back at each and every person. Occasionally I would pipe up singing, "hello hello, I don't know why you say goodbye, I say hello!" - but then they just looked at me weird. Going up hills the children would come out and run along us and try and race us to the top. It was a great experience. Luciano & Verena moved on ahead of us when Richard lost a spoke and then had yet another puncture. Since the road to Ta-oy, Richards' back wheel has been slowly but surely breaking up, and this poses us quite a significant and difficult to solve problem. Near where the spokes join the rim, large cracks are appearing, and this was the reason for the broken spoke and the continual string of punctures. To top it up Rich always has puncture problems in villages so I am left as crowd entertainment officer while Rich gets on with the business. While repairing this puncture, a young man, probably my age came out and bowed to me, and knelt down below, and smiled, and bowed some more, and smiled and held open his hands. People out here bring a new meaning to poor. They may only have one set of clothes, the children often none, and wander around in rags if they are lucky. The lucky few own a bike but most don't they gather their water from streams thousands of feet below, and live off the land around them. The guy held open his wallet to show two 50 kip notes (yes folks, 6000kip = 1 dollar) and it was all I could do to refuse giving him some more from my own wallet. But that would create more problems than it would solve, so I opened up some cookies and shared them around. The guy took 4, smiled and dissappeared. The rest of the packet disappeared into the crowd. Luciano & Verena were waiting for us at the next village. They had been searching for a camp site for us, but the abscence of flat land meant that our camp for the night was by a village hut on the side of the road. We unfolded the tents to the awe of the villagers and cooked dinner with an audience of at times 30-40. Even Luciano & Verena started to look at us in awe as we mixed up a splendid Thai curry! - I think they were positivly embarrassed with British people cooking a better meal than them. Meanwhile we watched them quickly reheat their lunch leftovers, positively embarrassed that Italians could be more efficient than us. - So much for stereotypes. Rich & I have always been quite shy & British in our camping attitudes, and were at first a little uncomfortable with all the attention we were getting. Luciano & Verena having experienced India were positively delighted at how polite the Lao people were in comparison. Indeed, the parents kept the children extremely well behaved, and no-one even touched any of our things. They were content to gather round and watch, but they always gave us plenty of personal space and we soon became quite comfortable. That night while sleeping, a truck rumbled around the corner and its lights shone through our tent. Richard sat bolt upright and stared at the lights in sheer terror before desperatly trying to scramble accross me and out of the trucks way. But the truck rounded the bend just fine and carried on its way. - I just laughed! We set off the next morning up a long big hill. When you have 20kms of up ahead of you, there is little to do but resign yourself to fate and just pedal slowly up it. Sometimes it is enjoyable just to let your mind wander... sometimes you need some distraction. I stuck some music on for a while allowing Luciano to joke for the rest of the day about me being stuck in my little disco. I soon moved over to my 'Learn Chinese' cassettes and completed the hill trying to articulate awkward phrases, while at the same time leaning on my handlebars studying the textbook. We stocked up on Feu, and some veggies for the evening at the tiny town of Phu Khun, and then spent the afternoon riding along a wonderful ridge with splendid, if somewhat hazy views to both sides. - Even though the road is the most major road in Lao, we were passed at most by about 4-6 vehicles an hour. That night we camped near a tiny little village called Ban Nong On. They were in the process of building a school and the cleared land was flat and had firewood and a view. The bonus to top it all off was that where they had been sanding the wood was a mountain of sawdust which made fantastic bedding beneath the tent. Great for me as I've been sleeping awfully on the hard ground, continually re-arranging my numb arms every half hour and contorting my body to avoid the rocks beneath the tent. We cooked another great curry and then sat around the campfire underneath the stars. Funny how it is that I've lost all track of what date and time it is in the day, but can immediatly tell you what phase the moon is in, while waking with the sun, and judging the time of day by the sun. As I write this, I haven't even seen my watch in several days... quite a change for someone whose life was ruled by time to the second. Luciano like all good Italians has strong opinions, and we stayed up late into the night busily arguing aboout capitalism, China, religion, and other things we both knew not enough about! After only an hour of cycling, we came down off the hill in a long screaming downhill that lasted some 16kms. It was wonderful flying down with the cool air and smoothish traffic free roads. At the bottom Richard looked on with the crowds from the top of a high bridge, as I took a dip in the cool mountain stream below. There is a well-known phrase that 'what goes up must come down' - I would like to propose an alternative to this.... 'what comes down must go up' - After setting off cool and refreshed from the stream, we started up the other side of the valley we'd just come down. 15kms up - aaaaaggghhhh! - This time, Richard set off ahead of me, and I was determined to catch him up. Meanwhile he was equally determined not to let me catch up, and so we found ourselves racing up a 3000ft climb with 40kg's of luggage each in the blazing sun. Louang Prabang turns out to be another food heaven. Probably the last one in quite a while... we think! - We also passed our 2000km celebration point just before so Rich & I celebrated with another delicious Pizza that evening, and we've got Chicken Tikka Masala pegged for tonight. - yummo! Richards wheel has worsened considerably over the past few days, and we need to replace it soon. Unfortunatly, there are no new 26" rims on sale here in Louang Prabang. - Perhaps if we backtracked to Vientianne we might be able to find cheap Chinese rims, but we are probably faced with a trip to BKK to find anything good. It is either that or continue pressing on and keeping our fingers crossed that we'll find something in China.... So we're deciding today, and will probably vote to continue on regardless. We estimate that the chances of Richards bike making it all the way to China are pretty low, but we'll just have to see won't we.... it's all part of the fun. So next Internet stop.... ???? not sure... perhaps Mengla or Jinghong in southern China if we're lucky!. A week or so to go to the Chinese border.